I admit I kinda have a little ‘thing’ for dishes. Okay it’s more like a full-blown obsession. 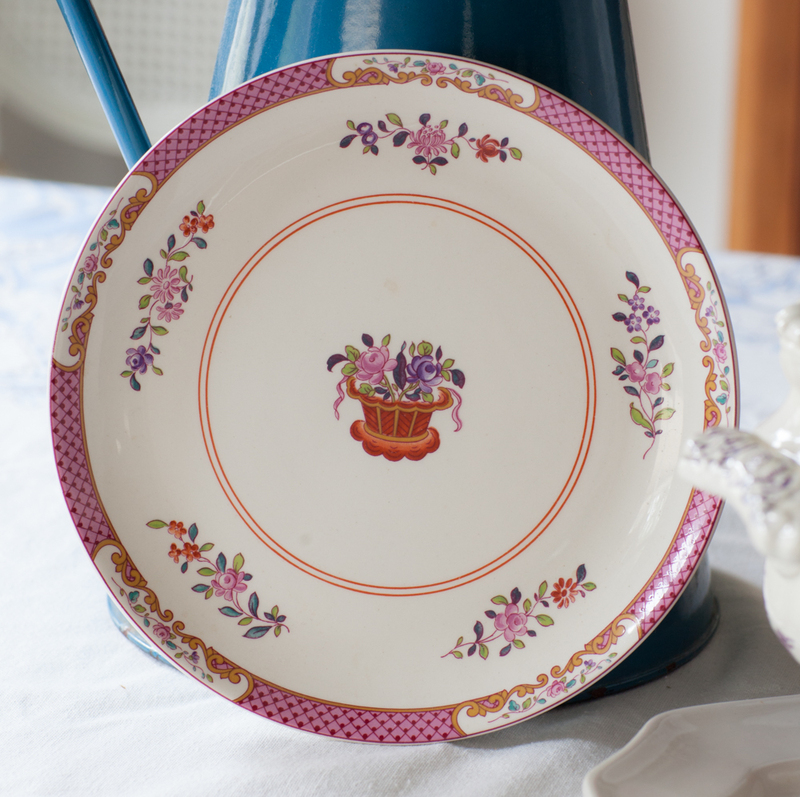 I love using Spode dishes for decorating and I love to use them as many places as I can. I also use other dishes, but Spode was my first love. Spode dishes have always spoken to me. 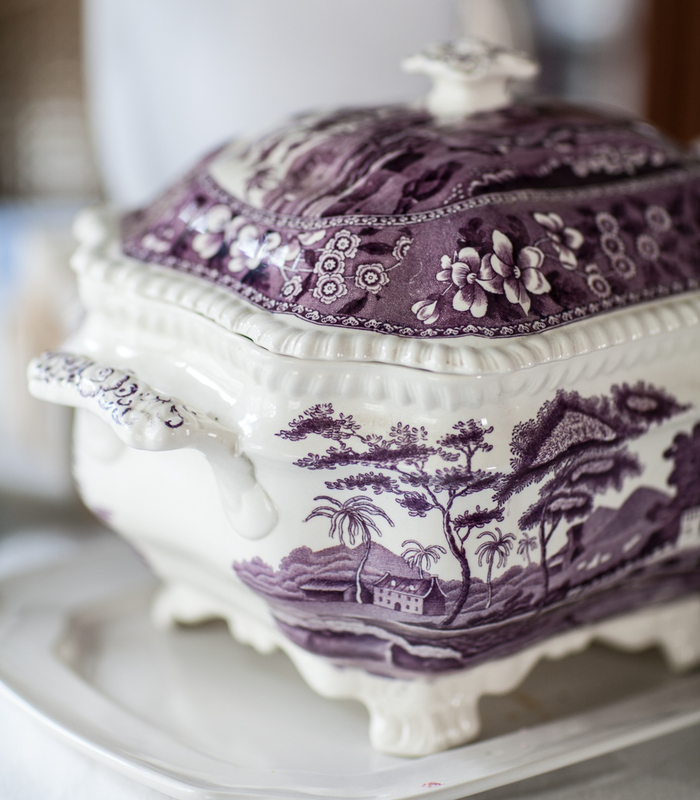 The purple transferware tureen is a Spode piece. The Spode company was founded by Josiah Spode who was born in 1733. He founded his company in 1776 at the same time the USA had it’s new beginning. Guess who his neighbor was? Josiah Wedgewood! What a talent pool! He focused his attention on a new type of porcelain called Stoke China. This Stoke China later became known as Bone China. When he died in 1797, his son, Josiah II took over the business and partnered with William Copeland. Spode is one of the most respected names in the China (dish) industry. Amazingly, many of those patterns from over 100 years ago are still in production. A lot of the blue and white dishes are still made. I love the pattern shown below. I just have one of these, but I think it’s beautiful. It’s actually about 20 years old. I used to have this plate on the wall. 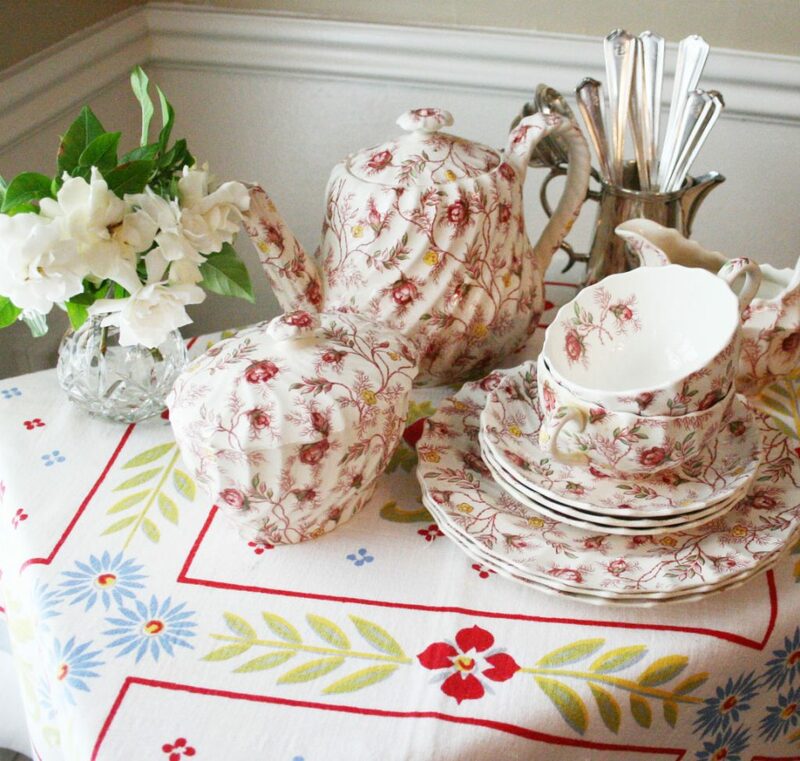 The Rosebud chintz below is also a favorite of mine. I had so many dishes that I decided to sell this set several years ago. So my new favorite piece is this Spode tureen. I believe it’s part of the Italian collection. I’m not sure how old the piece is, but it doesn’t matter to me. I love it. The ladle is missing, but I have several stray ladles sitting around, so I grabbed one of those. Here are some of my vintage dishes in the breakfast room. I thought you share my love of Spode dishes. Wait! I saw the announcement of Roundtop? Is that the Roundtop I have heard about forever!? On a side note, I love the light above the table, Anita. Yes are you going Laura? Thanks! I love that light also!!! I have never seen a piece of Spode that I didn’t love! I love my Spode china! I have more dishes than the law allows and love each and every one! Frankly, there’s never been a pattern I didn’t like. And Replacements LTD is heaven on Earth. It’s located in Greensboro, NC, just off of Interstate 40. My daughter, husband, and I all worked for them and still visit when ever we can. They specialize in China, crystal, silver, and collectables. Hallelujah! If you haven’t been there, you really should go if you ever get close; it’s a real treat! Their website is wonderful but seeing miles and miles of history and extraordinarily exquisite pieces of China, crystal, silver, and figurines is a sight to behold. They even have a marked down section. What more could you want?! Thanks for sharing, I know just how you feel! And now must get back to dusting my precious wall babies. Oh that would be amazing to go Replacements! ! I go to a thrift store that has a china room. I just love to go in there! I have a friend that has a China room in her house! The size of a small bedroom. Not only are the shelves lining the walls but there are 2 aisles of shelves! Linda, what a luxury! That is incredible. I would love to see that room. It’s definitely an obsession! Happy finding!!! Oh Barb, that’s funny! Not sure why I love dishes so much, but clearly we both do! Dishes, pottery, teapots, tea cups, yes,,,,, I do understand. One of my favorite photo’s has always been the plate racks on either side of the window. Wonderful idea. Oh Cheryll, thank you so much!!! Hugs to you. I am so into beautiful dishes and use them all the time. A table of mixed is always exciting compared to straight pattern set-up. My children will inherit my love for dishes and they too get excited over them. Oh I’m so glad your children love dishes! I wish my daughter loved dishes as much as I do. You nailed it today for me…made me stop and take a closer look. 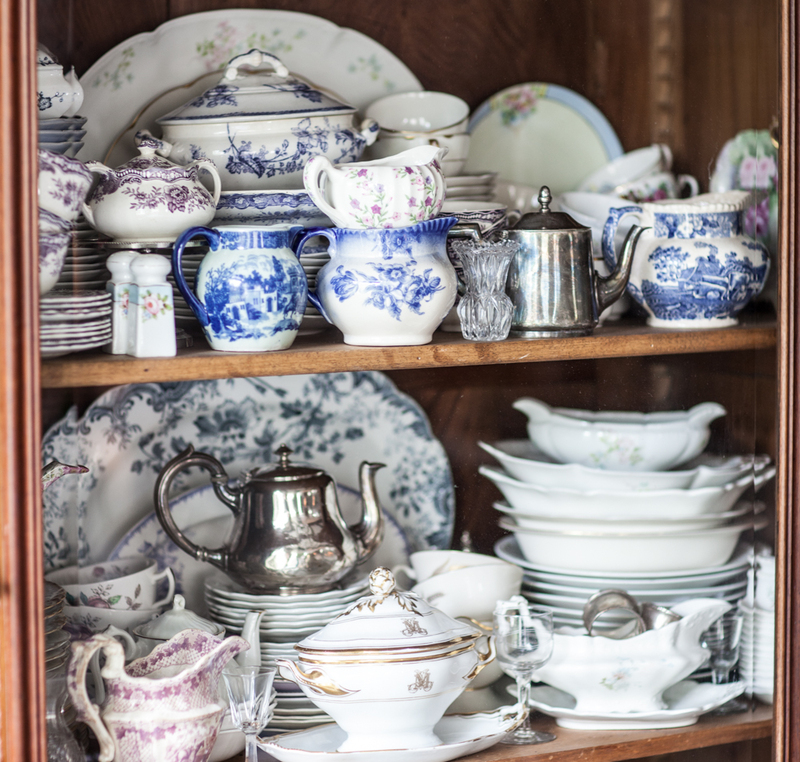 I too have a love for Spode dishes…or any beautiful vintage pieces of china. Actually my sister got that gene too, and we have a rule in our family …there is always room for more dishes! 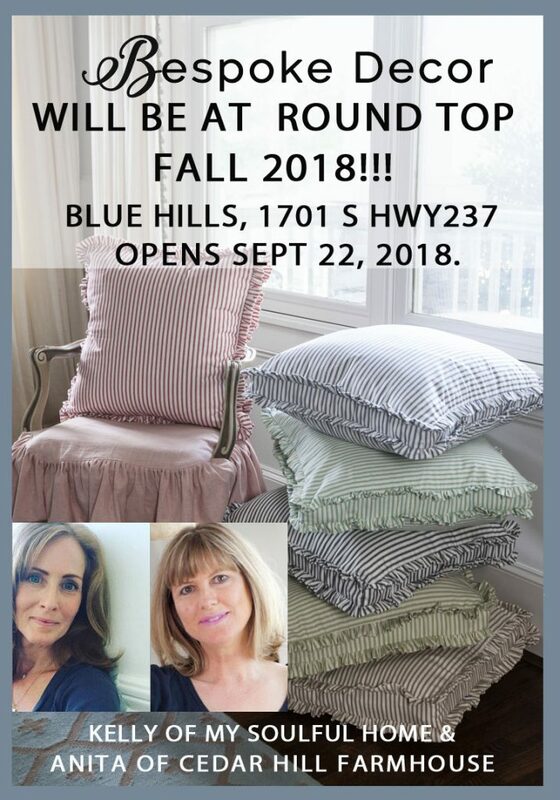 Hugs and hope to see you at Round Top! Anita, I love your blog always, but I especially relate to your love of dishes. I have them hanging all over my house. I am asked often about why I do that and not confine them to the kitchen or dining area. I just try to use my most “Are you serious” look and then simply say that they speak to me. It hasn’t been until recently I gave it much thought as to when I fell so in love with dishes. I finally remembered that probably as far back as being 6 years old when I received a child’s full set of Blue Willow dishes for Christmas. I set my small metal table with a red vinyl top with four place settings and insisted that I eat my turkey and dressing dinner there. I filled the gravy boat with dressing and it was my favorite piece. Then as a matter of habit, on my many explorations of the pasture behind our house, I would find broken pieces of dishes just lying on the ground, and I just knew they were meant for me! 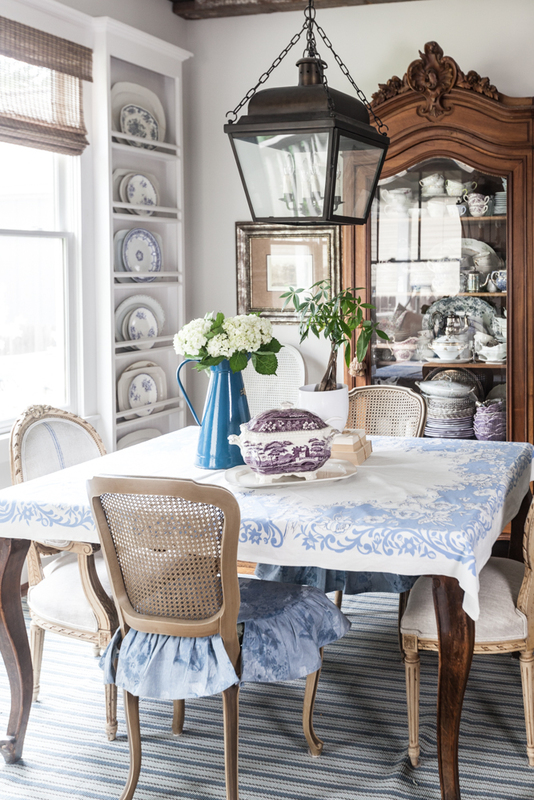 The dishes didn’t survive to my adulthood, but as I started collecting things for my home, I was always drawn to Blue Willow plates and jars and subsequently, expanded to any pattern (Often florals) that spoke to be and winked at me that I needed it. As I have just settled into a new home which will be my final one, I have gone crazy hanging all of my plates so that I can enjoy them all. Thanks for making me feel a kindred connection in spite of those people that just don’t get it! I have a small house so any “collections” are small. I do have Spode Christmas tree dishes and getting to use them is my favorite thing about the Holiday since my grandchildren are grown and there are currently no small children in the family to make Christmas magical. If I could, I would have dishware in every nook and cranny. I especially love pitchers and tureens – their forms speak to me – and your lavender tureen is so beautiful. I’ve never seen a tureen in that color. I’m sure you will be very successful at Round Top with your Bespoke items. They are lovely. Where will your booth be at Blue Hills? I am planning to go and bring my friends! Kathy, we’ll be on the north side close to FM237. Hope to see you!!! I have the same pattern tureen in red and white, just had to have it. I also have a very old green and white covered dish by Spode (the label on bottom says Late Spode encircled by Copeland Garrett). 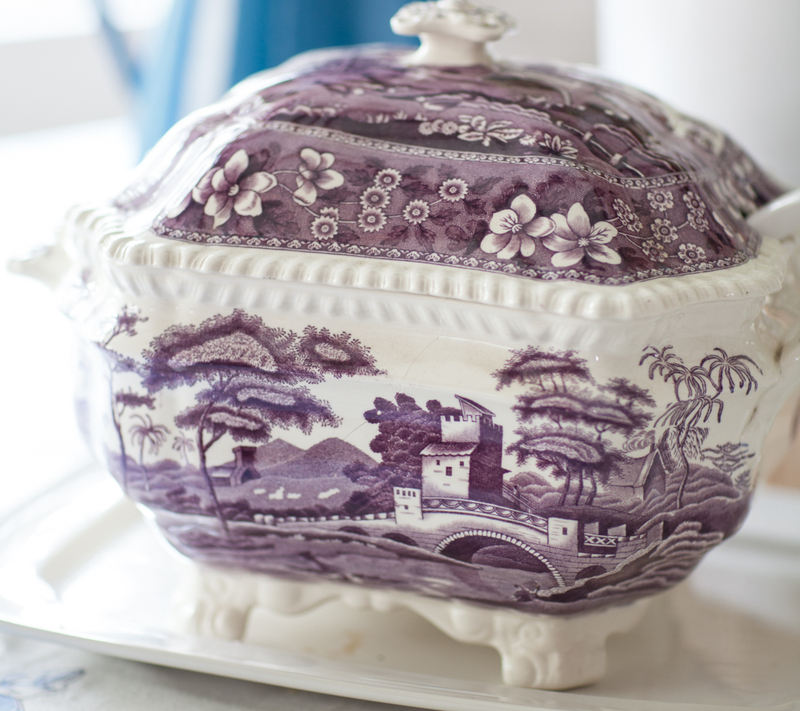 Your Spode tureen is just lovely, Anita! It’s really like playing house, isn’t it? For grown-ups! Thanks Barb! I haven’t served anything in my tureen because it has a hairline crack in the bottom. Sadly it doesn’t hold water. I found that out the hard way! I ended up putting the flowers in little short glasses inside the tureen. Yes I love playing house too. Great post! My daughter wants to collect Spode Woodland.